eVideon streams live Q&A with Samir Batra from HiMSS 2019 on 2/12/2019. eVideon is proud to announce that we will be hosting a Q&A with Samir Batra, live from our booth (6279) at the HiMSS 2019 Conference in Orlando Florida. The webcast, titled, "Designing for PX: What You Need to Know Before Implementing Patient Experience Technology,” is the first project of the new eVideon PX Innovator education series, and will take place on February 12, 2019, at 2:00 p.m. EST. Designing for PX is eVideon's theme for this year's show and will be highlighting how to design and use technology to improve the patient experience. This webcast will provide helpful insight into how to create the perfect environment for patients and staff in any healthcare setting. Whether you are looking to just up your PX game, are upgrading your facility, or starting from scratch with a new construction project; we will cover topics regarding patient experience, system implementation, system buy-in, software integration, the future of patient experience technology, and more. Join host Don McCauley, eVideon Regional Vice President, as he sits with Samir Batra, Founder & CEO of BAHA Enterprises, to discuss the latest in PX Innovations and tried-and-true methods that create engaging and empowering environments. "eVideon has always placed a premium on educating our partners in the design and implementation of patient experience technology," says McCauley, "Getting insights and advice from an industry expert - a thought leader - in patient experience technology, well… I can’t think of a better way to start this series." The eVideon PX Innovator series is a part of a larger initiative to provide ongoing support to eVideon's healthcare partners. More on-line presentations, articles, and videos created and presented by eVideon and our partners will follow this webcast. According to eVideon's Clinical Solutions Director, Spencer Draper, providing a space for patient experience education is new, but the idea has been around for a long time. "Creating a platform to learn about and discuss new ideas and innovations around patient experience has always been one of our goals. Our partners are always coming up with clever ways to use our technology to improve how they interact with patients. Having individuals pass along clever ideas from other hospitals is an inefficient way to communicate." “The eVideon PX Innovator solves that problem," continues Draper, "Now all our partners and anyone interested in patient experience can share in real-time." To watch the live webcast, tune in to eVideon's YouTube Channel, eVideon Health. Samir Batra has been in healthcare for 18 years and worked with many global healthcare provider organizations in helping them achieve operational efficiency and implementation of their strategic plans. The majority of his work has focused on the patient experience, workflow and cost optimization, and the effective use of technology. Currently, Mr. Batra is the Founder & CEO of BAHA Enterprises. BAHA is focused on helping health tech companies grow by raising capital, providing strategic advice and guidance, and validation of their solutions. Prior to BAHA, he spent over 10 years in executive roles at start-ups (Oneview Healthcare, CareInSync - acquired by Zynx Health, pCare - TVRC, and GetWellNetwork) focused on applying technology to effect clinical and patient processes to improve the patient experience and drive engagement. Passionate about contributing to thought-leadership and driving the effective creation of technology to impact healthcare, he has a number of strategic board positions with the following organizations and companies: HIMSS (NorCal Board Member and Co-Chair NorCal HIMSS Innovation Summit 2019), ATA (Start-Up Health Advisor - American TeleMedicine Association), The Beryl Institute (Resource Advisory Council), The Millennium Alliance (Advisory Board), Vonzos Partners (Executive and Entrepreneur in Residence), and NarrativeDx (Advisory Board). 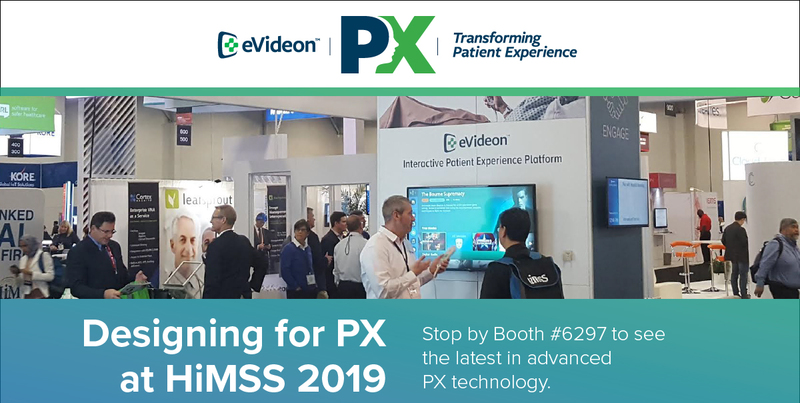 To fulfill our mission of “Transforming PX!,” eVideon partners with hospitals and other healthcare providers to provide the latest in interactive Patient Experience (PX) interface technology and education.